Tonari no Totoro (となりのトトロ) or also known as My Neighbor Totoro, is a wonderful animation movie created by the famous Miyazaki Hayao in 1988. 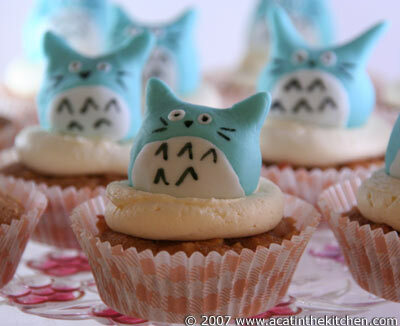 Have a look at these cupcakes and other foods created in the image of the Totoro character. I found these recently thanks to acatinthekitchen.com and timmaughanbooks.com. To bring back some good old memories, here is the closing and theme song from Tonari no Totoro. Anyone ready to make some Ponyo cupcakes? RT @Shibuya246: Totoro cupcakes, Japan Anime | Shibuya246 http://bt.io/9iz I,m hungry now. To be honest w/you I’ve never seen any anime of Totoro before,but now I have . Thnks for the video, it has a catchy theme song. as for those cupcakes I.ve see them before in the link you mentioned,they are quite cute and yummy looking. Seeing i just cleaned house they have really made me very hungry. Guess I’ll have to make something to eat.